The drive specialist is reorienting itself. maxon motor, the renowned specialist for mechatronic drive systems, prepares for the future by adapting its leadership structures. The old management board is becoming the group management board. This committee drives the global expansion of sales, development, and production centers and is in charge of the strategic orientation of the maxon group with its 2800 employees. At the same time, the Swiss headquarters in Sachseln is getting its own local management board. The board started its operations on January 1, 2019. Daniel von Wyl, who headed the maxon medical unit for many years, is taking over as the local managing director at Sachseln. The final transfer of all responsibilities will take place in 2020. There are two personnel changes in the group leadership: On January 1, 2019, Björn Axelsson joined the team. He assumes the newly created role of Group Human Resources Officer. COO Peter Grütter is leaving the group leadership. He has been with maxon since December 2013 and will tackle new challenges within the group. 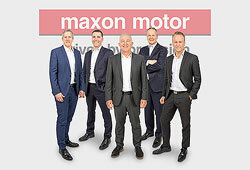 Among other responsibilities, he will handle the integration of the British electric motor manufacturer Parvalux with its around 180 employees, which was acquired by maxon at the end of 2018. In addition, he is in charge of developing the new maxon production site in Taunton (USA), which was opened in March 2019.